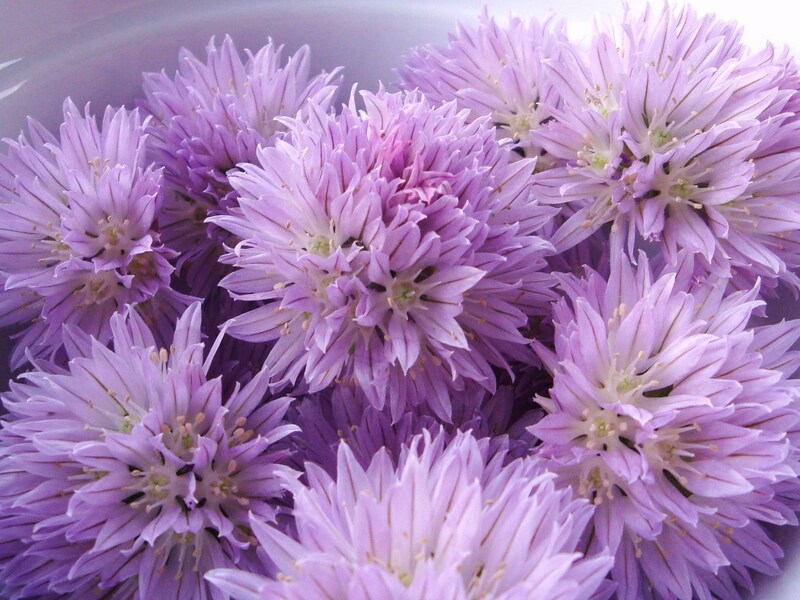 Chive Blossoms in Booze or Vinegar? As a canning addict, I have been a fan of Food in Jars for quite a while. So after seeing Marisa’s post last year on Chive Blossom Vinegar, I had been longing to infuse some chive blossoms of my own. As much as I wanted to try the Chive Blossom Vinegar, we do have certain priorities here at Boozed + Infused. So when my chive blossoms finally started opening up, the first ones went into a booze infusion. There would be plenty more blossoms for vinegar later. I was going for something reminiscent of a Gibson with this infusion. Following Marisa’s instructions for the vinegar infusion, I soaked the blossoms in water to help remove any sediment or insects. Remove from water, toss in towels, and allow to dry. Add chive blossoms, gin and vermouth to a pint jar. Infuse for a few hours, a few days, or up to a week depending on how strong you want the flavor. Strain and filter the infusion. I infused this for 6 days, and this has a very strong onion flavor. I have made a few cocktails with it, but so far the jury is still out on this infusion. It is not for the faint of heart. I think my favorite cocktail with the chive blossom infusion so far is a variation on a Bloody Mary. I now have a jar of white wine vinegar infused with chive blossoms, and another jar of distilled white vinegar infused as well. It was very interesting how much more vibrant the vinegar is than the gin/vermouth infusion. The booze infusion is the one that is just faintly pink. For the vinegar infusions, I left the blossoms in for about three weeks. Be sure to check out Food in Jars for lots of great ideas on canning and all manner of foods in jars. I recently purchased the Food in Jars cookbook and can’t put it down! 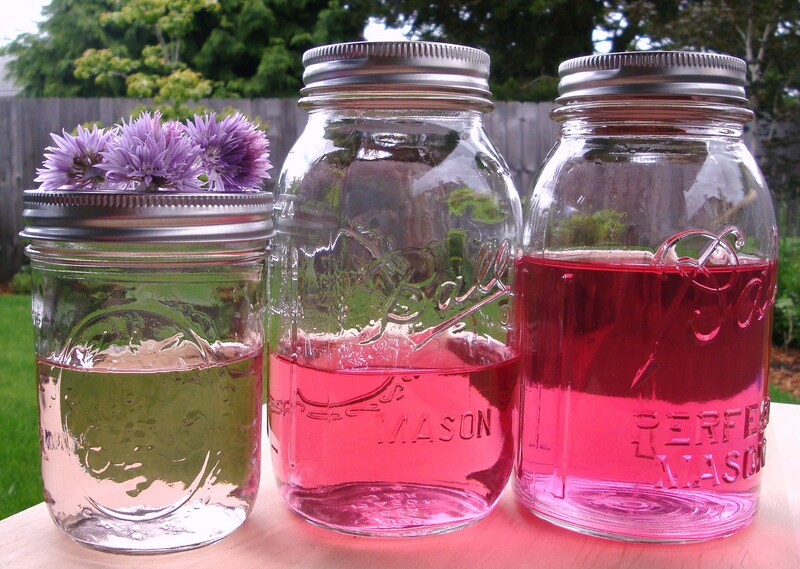 Categories: Infusion, Recipes | Tags: chive blossoms, gin, infusion, Vermouth, vinegar | Permalink. I can see where people who like onions in their martinis would like the Chive Blossom Martini. Good idea! 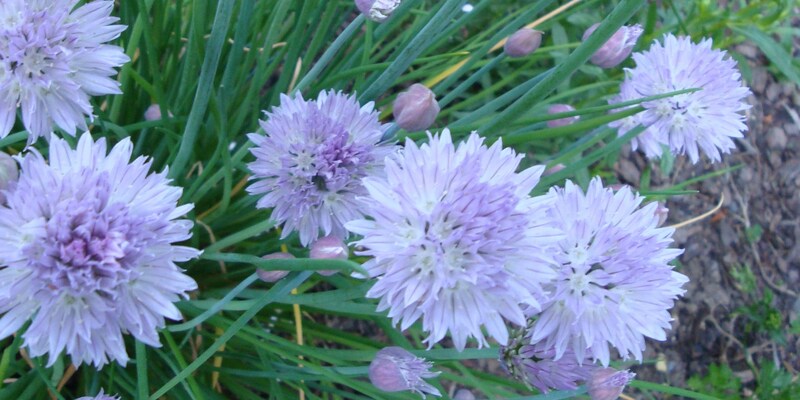 I made Chive Blossom Vinegar in the Spring and wrote about it in one of my early posts. I added garlic and golden oregano. It is really good in salad dressings. Yum! The garlic and golden oregano sound like a great addition. I finally made a simple dressing last night with just adding the vinegar to a little honey, evoo, sea salt and pepper, but the best part was putting it on some fresh lettuces right out of our garden. Thanks! I was shocked to see how pink the vinegar became, after the gin/vermouth infusion was such a faint color. If you love a good allium kick, then the booze infusion may be just the thing for you. The flavor comes out really well, and it didn’t take too many blossoms. I always love looking through canning books, and Food in Jars has a lot of great recipes. Have you made any of them yet? Well, vinegar is still a great thing- and the photos are beautiful! Thanks! And yes, vinegar is a great thing. We finally used some of the vinegar in a salad dressing with some fresh lettuces right out of our garden. Very exciting to finally get some home-grown veggies – I know you’ve been enjoying yours for a while! That sounds great…chive vinegar on fresh greens…nice. Sorry I missed getting back to you sooner! The booze is definitely a strong flavor, and I agree it is,not for everyone. I may end up using some of the chive blossom booze in a cream sauce. Try the vinegar. It is a nice flavor!